Eating local food when it is in season — elitist though it may be — is a good trend for food in America, one that I hope has more staying power than most foodie fads. To that end, I try my best to try to promote that style of eating, on this blog and in my life. Farmers markets, winter squash recipes, pickling — all are inspired by the desire to enjoy the unique fruits of Minnesota. But sometimes I worry that this parochial focus threatens to cut us off from one of the greatest joys of eating: food’s ability to transport us to a place far away from home — for a fraction of the cost of air-fare. Yesterday in Minneapolis was one of those days when one might have wanted to be somewhere else. Seventeen inches of snow in the space of a day can make you question your choice of the latitude you inhabit. Actually, the snow was pretty enough to watch if you didn’t have to drive anywhere — a situation Martha and I thought we were in until we realized our car was parked on the wrong side of the street. An hour, many shovel-loads of snow, and several good samaritans later we had the car parked safely out of the way of plows and were back inside for the rest of the day, hanging our clothes up to dry and thinking about the joys and challenges of living in the Great White North. But as we had breakfast in the morning, leisurely eating arepas individually buttered, salted, and topped with cheese, we might as well have been in Cali, Colombia, enjoying the morning hours before the day’s heat and afternoon rains arrived. Martha’s Aunt Stella would wake us each morning with these freshly-grilled corn cakes as well as orange juice and coffee. After taking our time over breakfast it was just a short walk to Uncle Joaquín’s café — attached to the house — for a tinto and conversation with the regulars. In Minnesota yesterday morning our orange juice didn’t taste quite as fresh, and the coffee could be better (we love our Peace Coffee but you can’t beat coffee right from the source) but the taste of lightly fried arepas made the snow seem remote, something we were reading about in El Tiempo rather than something rapidly burying our car in a small white mountain. We make arepas with Masarepa blanca that we hand-imported from Colombia but that is also available in all the Hispanic grocery stores in Minneapolis and can be ordered online. I just follow the package instructions: mix a cup of masarepa with one and a quarter cups of water and salt to taste, let the mix rest a few minutes, and then form ping-pong ball-sized balls into flat patties with very wet hands to prevent sticking (I use a side bowl of water to keep my hands hydrated). 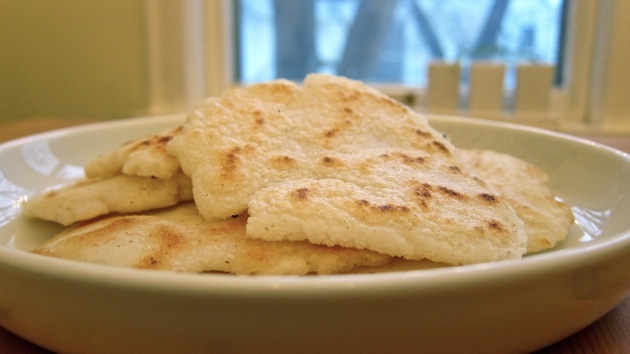 Tradition calls for these to be cooked on a parilla, a device for cooking them directly over a gas flame, but I have better luck using a non-stick skillet instead — the arepas stay together, brown more evenly, and can be cooked more than one at a time. After spending our morning in Cali and much of our afternoon in the harsh reality of Minnesota, by evening we were ready to take another trip. 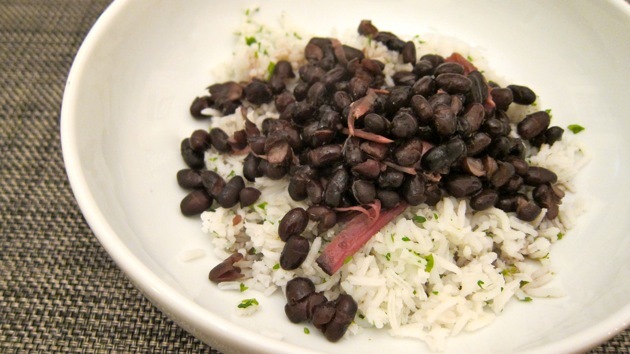 Black beans and white rice is a dish enjoyed throughout the world, especially in Latin America, but for me it’s something I associate most with Cuba. Since the snow shut down most of the grocery stores early we had to rely on the supplies already in the house. Delving deep into the freezer produced a ham hock, which when combined with dried black beans, a bay leaf, half an onion, salt and water and left to cook for a few hours before being spooned over white rice makes a satisfying meal whether you’re at 45 or 23 degrees north. It never snows in Havana, so how could it be snowing when you’re enjoying soupy black beans and rice? This entry was posted by Tom on Sunday, December 12th, 2010 at 1:18 pm and is filed under Food + Drink, Minneapolis, Travel. You can subscribe to responses to this entry via RSS. Colombian food is such a good choice for the winter. A lot of the staples are stick-to-your-ribs kind of food. I hope to do a lot more Colombian food exploration this winter, when the lack of farmers markets makes me feel a little less guilty about my non-locavore tendencies.